Hi everybody !!! Do you like dresses? I like dresses too much but I am a tiny woman with a size of 156 cm and it is hard for me to find dresses. They are often too long for my lenght. 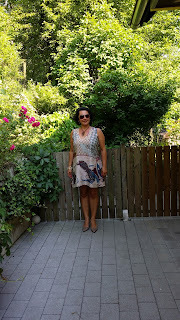 This time I was lucky and I find a wonderfull dress from Romwe. I do not always wear high heels but I think this shoes are a good combination for this look. What do you think about it? 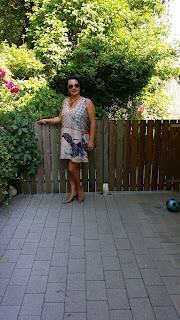 It is really a very light summer dress. I am very happy that I must not return it. You have just to read carefully the size chart. That' s all. At July and August I have vacations. Dresses like this are perfect for vacation time. But you can also wear it by your work or for an appointment. I hope you likes my dress too. If you want more informations about this dress or other Romwe clothes just click here or at the pictures. I wish you all warm summer days.